Bob Dylan’s Planet Waves became an event even before the album was released and revealed itself as an understated masterwork. His first studio recording in nearly four years, the homespun 1974 effort finds him reuniting with the Band, by then firmly established as virtuosos. The chemistry is obvious on every song. And the modest and spare production only magnifies the honesty and purity of the collaboration. Mobile Fidelity’s 180g LP deepens the music’s emotional connection and rustic warmth to the fullest possible extent. Throughout, Dylan’s voice supplies subtle hints about his mindset and intent as the Band shadows him step for step, adding to the thematic ambivalence and contributing to a debate over meaning that continues today. 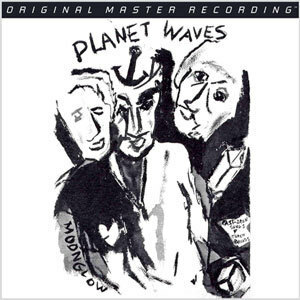 Indeed, such relevance confirms the significance of Planet Waves 40 years after its original release. Mobile Fidelity’s analog version digs beneath the surface and helps expose the record’s buried strains.